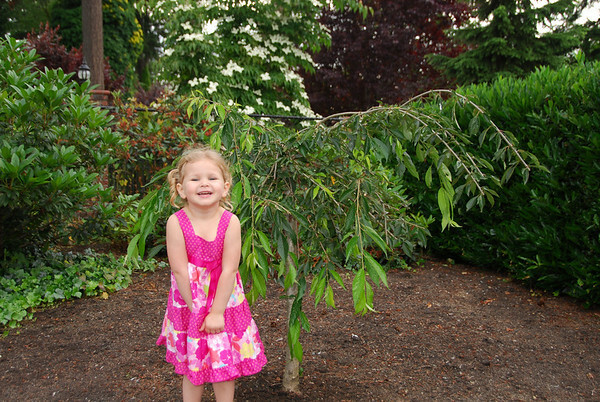 Every birthday we take a picture with you and "your tree" that we planted when you turned one. Abigail, you are officially three. What a blessing you have been to us the last three years. Your Bible Study teachers have said that you are their "sunshine." You are ours too. You come down the stairs each morning with a bright smile on your face. A smile is what you wear the most....well, other than the amazing amount of clothes you change into throughout the day. You are a total goof, and clothing changes constantly make me laugh. From coming downstairs in one of Kenzie's swimsuits, pajamas or dresses, to your princess clothes, to one of your favorite dresses, to a random combination of goggles, hats, gloves, socks, shoes, and anything else you can get your hands on. You are often trying things on, looking at your reflection in any surface (oven door, french doors, mirrors, windows) and dance and sing in whatever costume you've decide to dress yourself in at the moment. Lately, dresses are what you want to wear the most. You are such a smart girl, Abby! You know all of your letters, both upper and lower case. You know all of their sounds too - although the vowels can stump you at times. You are beginning to recognize some sight words (no, yes, mommy, daddy, Abby, Kenzie, grandma, Zach, the) and are beginning to even read. You do pretty well at reading -at and -an words. Speech you excel at. You are so articulate and have a very vast vocabulary. I am amazed at some of the words you remember. One story is about how we were going to the horse races. You said, "Will they have a carriage?" I asked how you knew that word, and you asked if I remembered the story in church where the man was in the "carriage" and had a "scroll" that he didn't know how to read... Seriously, Child, you blew my mind. The story was a few weeks earlier at church. You know, understand, and retain so much! You can also write your name, a few other letters and trace other letters very well. In drawing, you can draw simple things like a stick figure, smiley face, rainbow, balloon or sun. You can count to twenty unaided and then only need a few gentle reminders to continue from there. You seem to understand how things work and go togethere. Family and friends are a highlight because you are social and especially care for those closest to you. Currently, you call the family "your people." "Will 'my people' be there?" is a question that comes frequently. People are not intimidating to you. A Starbucks cards was a gift from friends at your birthday, and you easily take your own card up to the cash register and ask for the items you want (normally a smoothie and birthday cake donut). People enjoy you. You are good at sharing and giving, although you sometimes need reminders. The kindness and generosity you show your sister often amazes me. You guys have such a good relationship because of the sweetness you show her in actions and words. You make up your own words to songs, often trying to be silly. You have an imagination and creativity. You enjoy books, puzzles, games, people, music, swimming, watching movies, dress up, dolls and anything new. Independent, you'll enter someone's house and just want to go explore by yourself. Grandpa and Grandma Kern say you're the only grandkid who will just wander downstairs by yourself to play. Even though you love to be around others, you are often perfectly content on your own. You are pretty obedient (most of the time). Emotional reactions to frustrations is sometimes your first response. I told you that you can no long "freak out" now that you are three, and you've actually been doing really well. Because I told you that, however, for a couple days you said you didn't want to be three but still wanted to be two. Yet, you still try not to freak out. You barely need reminders for "thank you" and "please." I want to say, "thank you," for being such a polite, wonderful child to be around. Food doesn't interest you even though you'll eat just about anything with no pickiness. Any activity is more appealing than sitting down at a meal. Candy and/or sweets are a totally different story, however. You will drop anything if you sense that dessert is in the house. I was recently thinking about how you don't really fear things. You jumped into your current swim lessons head first. You don't get bad dreams and have never been afraid of the dark. People don't intimidate you, and you enjoy watching the snakes that live down by the beach. I can't think of something that you fear. Abigail, I pray that you continue to love God. You went to a boy on the beach the other day and reminded him that he is "wonderfully and fearfully made." You retain Bible verses, and you are working at applying that to your life, with some reminders. Stopping to pray for someone you know is sick is something you think of on your own. I love that. Being at church is something you enjoy. Keep bringing joy to this world, my sweet baby girl. You'd remind me right now that you are not a baby, and I guess that's true. You are my "big girl" now. As I say to you often, "I love you so much...way up to the moon and back....forever and always...no matter what!!"